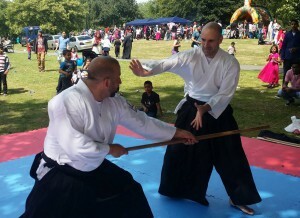 The techniques of Aikido have their origins in the movements of Kenjutsu (Japanese sword arts) and the joint locks and throws of Jiu Jitsu. 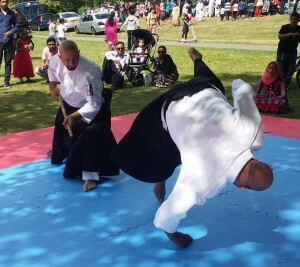 The are no competitions in Aikido. Students take turns initiating (Uke) and defending (Nage/Tori). Each student learns both sides of the technique. In addition to an activity that will develop core strength, balance and self confidence, Aikido also teaches it’s practitioners a practical self defence that seeks resolution to conflict without resorting to violence. You are welcome to come and observe a class if you do not feel you are ready to begin practice. Please arrive before the class begins and introduce yourself to one of the instructors. No uniform required, wear lose fitting clothing (tracksuit and t-shirt). No previous martial arts experience needed.